And he felt it on his foot. Just after he put it in his mouth. This past week, Martin O'Malley did a podcast interview about the 2016 presidential election and the future of the Democratic Party, and the topic eventually gravitated to who could have defeated Donald Trump if Hillary Clinton had not been the Democratic presidential nominee. O'Malley said that he was certain he could have won, and he also said Joe Biden could have won. I agree with both assessments. But get this. He also said that Bernie Sanders would have lost. I disagree. But more significantly, Bernie Sanders supporters also disagree - vehemently. Progressive Facebook pages lit up this past week with Bernie backers hurling one insult after another at O'Malley, calling him every epithet in the book. 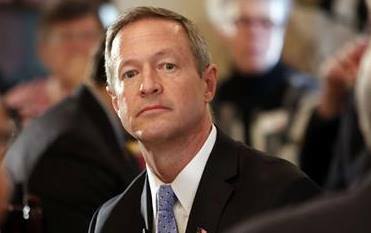 Adjectives used to describe O'Malley have included "egotistical," "self-delusional," and "stupid." This is nothing new; Martin O'Malley has had to put up with such insults for the past couple of years. What's new is that he's being insulted by Sanders supporters. Managers and strategists in both the Clinton and Sanders campaigns treated O'Malley with disrespect and scorn during the 2016 primary campaign, and so did rank-and-file Hillary supporters ("Martin who?" was a favorite taunt of the Hillbots). But I encountered numerous Sanders supporters on Facebook who were respectful toward O'Malley and his supporters, and they found Marty to be quite admirable; some of them even said they would have backed him had Sanders not run. O'Malley's remark about Sanders erases a good chunk of the goodwill he had cultivated among Sanders supporters, who will likely have to look for another presidential candidate to get behind in 2020 due to Sanders's age, and they will be a force to be reckoned with then. As someone with a formidable progressive record that compares pretty well with Sanders's, O'Malley had - and may still have - a realistic chance of winning over these voters, but he hasn't done himself any favors by telling Sanders supporters that their candidate would not have defeated Trump. Even worse, O'Malley made a lot of good points about the issues and the challenges of rebuilding the Democratic Party in this same podcast interview, but thanks to his egregiously stupid remark about Bernie, no one is going to care about any of that. Nice going, Marty. Fortunately, O'Malley has a chance to recover. Not too many people may have noticed what he said about Sanders because his comments were overshadowed by Sean Spicer's godawful comments about the Holocaust, which were twelve trillion times worse. Right now, O'Malley is scheduled to visit New Hampshire on April 23, with some campaign-style stops and a town-hall meeting on the itinerary. He'd best be careful at the town hall meeting, because someone's bound to ask him questions about his remark about Bernie Sanders, and Marty may be foolish enough to try to answer them. And if I may play devil's advocate for a moment . . . what if turns out that O'Malley was right about Sanders? As I recall, I posted a blog entry in March 2016 in which I discussed O'Malley's observation that Donald Trump could possibly win the Presidency. And we all knew that that was a preposterous thing for him to say.